If you’re still fence sitting on the need to travel green, then head on over to Go Green Travel Green. Their ‘25 Days to Green Travel’ series might just help you decide what type of traveler you want to be. The first post in the series ‘31 Reasons to Travel Green: In Pictures’ is enough to make you cry. The pictures feature birds covered in oil, polar bears clinging to melting ice, polluted rivers, and much more. The second post ‘Defining Green Travel’ also features stunning pictures, but this time to remind you of the beauty in the world. 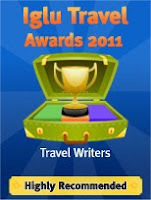 The third post offers up the ‘Ultimate Directory of Top Green Travel Destinations’. The fourth post focuses on ‘Learning About the Local Culture’.